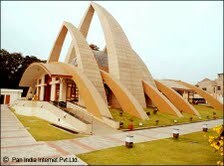 This temple is located in Telco area of Jamshedpur. It sits on top of a small hill. From atop, one can see the beauty of the city with river flowing amidst the green blanket of flora. The temple is situated at an altitude of around 500 ft. People come from far and near to offer prayers to Maa Bhuvaneshwari. Sometime during 1930's, Shri Rang Rajan, a Tata Motors Employee, had a dream of a Shiva Temple in place of a makeshift temple that actually existed. This is how work for construction for this temple commenced. The foundation stone was laid in 1978 by Sarosh Gandhi, who was Director of Tata Motors at that time. The temple structure and design resembles that of Chola architecture. The ''dhwaja sthambha'' or flag post bears a metallic flag which is symbolic of the deity. The lion or ''vahan'' is symbolic of the presence of deity inside. ''Balipitham'' is the place where the temple care takers offer food grains twice daily for the birds. The entrance is called ''raja gopuram'' i.e. royal entrance or royal tower. The temple gives a glimpse of South Indian style architecture. Maa Bhuvaneshwari resides in the ''garbha griha'' or sanctum sanctorum. At the center of the temple compound, there is a durga statue with eight forms of Goddess Lakshmi carved on eight pillers. Pahari Maa is the reigning deity in Gol Pahari temple (mandir). It is built on a hill near Tatanagar railway station.An annual festival is organized in the railway loco colony to offer prayers to Pahari Maa.A devotee has to climb about 100 stairs to reach the temple. The devotees visit the temple to seek blessings of Lord Ayyappa and bring prosperity in their lives. Lord Ayyappa is also known as ''Hariharasuta'' since He is the son of Hari (Vishnu), the saviour and Hara (Shiva), the destroyer. He is also known as ''Manikanda''. This temple is also known as ''Fire Temple'' or ''Parsi Temple''. It was built in the year 1960 on Straight Mile road, near Jubilee park. The same year, fire in the temple was shifted from Bombay by Plane. The temple is dedicated to the holy fire of the Parsees. It will be interesting to note that the fire has been burning in the Cursetjee Manekjee Shroff Agiary in Bombay since 1790. The Agiary was designed by J.K.Gora and Shri Jhangir Gandhy laid the foundation stone on 18th November 1954. All the religious ceremonies of the Parsees are performed in the agiary. Every Sunday, religious instruction classes are held for the youth. The Parsees are fire worshipers and the holy flame continuously burns in the Parsee Fire Temple. The Non Parsees are not allowed inside the temple. Their religion is Zoroastrianism which is based on the teaching of prophet Zoroaster. It was founded in 6th century B.C. and is one of the oldest religions of the world. A priest named Jaga Basistha Dev established this temple in 1932. It is thronged by one and all to worship Goddess Kali. The temple is elegantly decorated on festivals. The temple is located near Loyola School just opposite Beldih Club in Kadma area. The temple lights up with ''diyas'' and fragrance of incense sticks on Saturdays when most of the people come to offer prayers to Maa Kali. The construction of this temple began in 2008 on one acre of land near C.H.Area. The architecture of the temple is modern yet sublime. 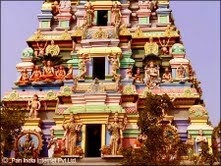 This temple is one of the main tourist attractions of Jamshedpur. Devotees throng the temple in large numbers especially on Thursdays to offer prayers to Sai Baba. The huge marble statue looks beautiful . ''Prasad'' is offered after ''aarti'' every evening. However, it is prohibited to click photos inside the temple campus. This temple was established in 1919 and is about 90 years old temple.The executive body election of the temple will be held on April 21, 2013. Located in the heart of Jamshedpur,in Bistupur area, it is the only temple to have e-darshan counter of Tirupati (Temple of Lord Venketeshwara in Andhra Pradesh). This beautiful temple is located in Kadma area. It is an old temple dedicated to Goddess Rankini. Many devotees visit this temple every day. The temple also has idols of Goddess Kali, Ram,Sita and Hanuman and Shiv Linga for the devotees.